and the wider world, then it can be a worthwhile goal. the first steps to discover your unique soul and live your authentic life. Sometimes we feel courageous, other times we feel discouraged. Sometimes we feel extraordinary, other times we feel ordinary. Sometimes we feel powerful, other times we feel powerless. Sometimes we feel respected, other times we feel neglected. Sometimes we feel joy, other times we feel sorrow. Sometimes we feel love, and other times we feel hate. Whatever emotion we might be feeling, know that they are all part of our soul's emotional journey. The journey from one level of awareness to the next. The journey from one kind of thinking to the next. The journey from one stage of understanding to the next. So instead of letting our feelings of powerlessness, sorrow or hate disempower us, we can instead turn them into a catalyst for mental and emotional change. To return to our sense of power, the kind that makes us feel more hopeful and confident. Understanding that by owning our feelings, we become more in touch with our inner authentic self. And as we become more at one with our inner self, we become more in tuned with our heart's inner light. It's time we accept our feelings and become a heart warrior. Happy Full Blue Moon! 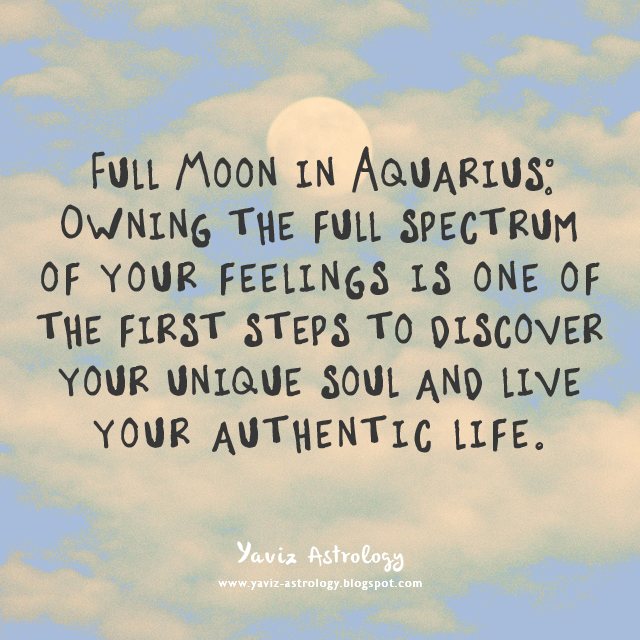 The Moon is in Aquarius opposing the Sun, Mercury, and Jupiter in Leo, marking a vibrantly intellectual and individualistic Full Moon in the sign of the Water Bearer. It's called a Blue Moon because it is the second Full Moon that happens in a month, and like all rare occurrences, it happens 'once in a blue moon'. Although technically this happens every two to three years, it's still considered quite rare because there's usually 12 Full Moons in a year (1 Full Moon per month). The last Full Moon — which was called the Thunder Moon or Buck Moon, happened back on July 1st. Planet Uranus is the modern ruler of Aquarius, while planet Saturn is the old ruler of the sign. With two planets complete with two opposing energies ruling the sign, the Aquarian energy can be quite contradictory. Aquarians are often very original, open-minded and progressive, while other times they can be quite stubborn, rebellious and unemotional. They like to let other people totally be themselves, the same way they want other people to let them be their own unique selves. Ultimately, Aquarians are true visionaries and humanitarians at heart. Ruling the 11th House in Astrology, or the House of Friendships and Dreams, the Aquarian energy is all about working in tandem toward a common goal - whether through a shared dream or a creative vision. With Aquarius' ruling planets, Uranus and Saturn, currently in their retrograde phase, this is when we want to channel our creativity straight from the heart. The Moon is also forming an opposition to Mercury and Jupiter, and we could be quite spontaneous in what we want to say and do to liven things up. We can't seem to ignore the strength of feeling we feel to do something big with our creative skills. Intelligent and honest conversations that take place could make us forget about the stress of yesterday. Try not to make assumptions along the way, be patient as someone could have some inspiring insights for us. These are exciting times, but we could become so opinionated that we waste a lot of time and energy defending our beliefs instead of doing what we really want to do. We can avoid unnecessary arguments by adopting a more easy going approach. We will also have to accept our own limits as we can't always be available to everyone. Remember that we are the creator of our own dreams and only we can make it work for us. With the Moon's sextile to Uranus Rx and square to Saturn Rx, we can put ideas we have into action and watch them steadily unfold. There's a hint of luck to this period that could bring in a surprising opportunity for us. Work we have to get done will work like a charm, and our positive thinking will have a lot to do with that. Enjoy the power we feel in handling responsibilities as we are fired up and ready to go. We will discover that the more confident we are, the better the results will be in anything we do. A Full Moon is a time of culminations. So it's always a good time to see how far we've come, and where we need to go next. Do not hesitate to move into a fresh new direction. Take steps to create what we want in life and focus on it with a clear mind. Put our attention back on increasing our sense of self-worth. Be honest with ourself. Stay open and keep following the path before us. Our soul is guiding us to express ourself in more creative ways. Now is time we allow our inner artist to enjoy true freedom of expression. signs along the way guiding you from one point in your life to the next. Why is this happening to me? Why did I have to go through that? What's the message I need to get from this experience? These are a few questions that may come up in our mind whenever we go through something we deem to be unpleasant. And many of us have probably heard the saying, 'Everything happens for a reason'. But how can that help us when we feel like we have no clue the real reason behind an experience? What then, can we do to understand better the experience? Well, the fact that you're reading this right now tells me that you've come out alive — and much stronger than you may believe yourself to be. Regardless of what have happened to us in the past, or how we feel about a particular experience, know that they are all part of the dots. The dots that connect us from one point in our life to the next. So instead of seeing those unpleasant experiences as obstacles, we can shift our perspective by seeing them more as signposts. Signposts that show us the way towards our most authentic path. A path that is more in an alignment with who we truly are. A path that is more in tuned with our deep inner truth. Trust that regardless of where we may have been, a new day always brings with it a new way forward. Release the need to find immediate answers. Instead, let the dots guide us to walk in the direction of our dreams. Trust and follow our heart. Happy New Moon! The Moon is in Cancer conjoining with Mercury, Mars and the Sun, marking an especially powerful and dynamic New Moon in the sign of the Crab. Like the sea creature, this New Moon brings to us the chance to move forward, and become more at one with our emotions and inner sense of home. Guiding us to focus more fully on what's possible for us in the future, and see more clearly what we need to ultimately leave behind in the past. 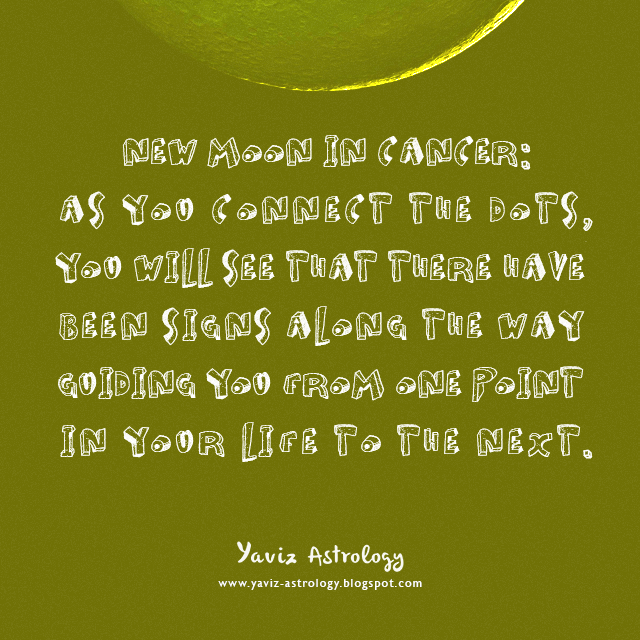 Although this may not be easy, because the Cancer energy tends to hold on to things from the past. But with Mercury and Mars close by, we will finally have the courage to open a new chapter in our life. One step at a time. One moment at a time. One feeling at a time. The Moon herself feels at home in the sign of Cancer. Ruling the 4th House in Astrology - or the House of Home and Family, Cancers are known to be loyal, caring and dependable bunch. They may seem oversensitive or moody at times, but they are generally more in touch with their emotions than most people of other signs. The 4th House itself is about our base, ancestry, heritage, and roots of the Self. It also represents physical structures (real estate), as well as history and traditions. The New Moon in Cancer opens up a new doorway into our emotional world. Helping us to realize that it is time we become the captain of our soul. With the Moon forming a trine to Neptune Rx and Saturn Rx, try to move inwards and use our energy where it is most needed. Our perseverance will pay off, even before the end of the week. We will be like a sponge, sucking up information from books and people and still be looking for more. Do not close the door too quickly on something we are not so sure about. Instead, ask advice from someone who is older or with more experience, it could turn out to be something worthwhile. Remember to give our imagination more freedom and we can accomplish a lot more with new insights that come our way. All that we have wished for can work in our favour to bring things together that can contribute to our happiness. Know that joy is the highest energy of all. It's the magical sense that anything is possible. Joy comes from appreciating the gifts in each moment. A joyful outlook brings the freedom we desire, while meeting our responsibilities at the same time. The Moon is also forming an opposition to Pluto Rx and a square to Uranus, and we should be open to release those emotions, as this time is made for us. We can draw a lot of strength from this energy that can lead us into something very transformative. We could be very ambitious with new opportunities that come along and we will leave no stone unturned to reach our goals. An emotional experience may leave us feeling uncomfortable, but the planets in Cancer encourage our mental ability to become more aware. We can learn a lot from other people's point of view. And we will like the change that comes about as new inspirations sink in. Put those worries aside, live and laugh for a change. A New Moon is a time for new beginnings. A time when we can plant new seeds and start again. A time to face old feelings so that they can be released and cleared. Let go of an unwanted pattern by forgiving one or more family members (including ourself). Release any guilt or fear regarding asking for what we want by clarifying our desires. We are in the process of healing our heart. Follow the dots. when I need help with finding the right words for my inspirations. where I want to be to inspire me and not terrify me. but they all lead to one destination, owning your soul magick. What's your magick? Each and every one of us has our own personal kind of magick. According to an English occultist, Aleister Crowley, magick is the science of understanding oneself and one's conditions. It is the art of applying that understanding in action. Going for our dreams surely requires a certain level of faith, vision, determination and hard work on our part. This is the kind of magick that we can cultivate as we go forward in life. The magick of intention and action. The collaboration between belief and effort. Some may find it easier to dream rather than to pursue those dreams. And some find it easier to pursue their goals rather than to find inspiration from their dreams. Whatever the case may be, one can not fully manifest without the other. Dreams can not fully come to fruition without action, and action can not fully bear fruit without dreams as the driving force. Listening to our soul and owning our personal magick is the first step we can take to get those dreams we have moving in the right direction. As we nurture our dreams with positive inspiration and daily action, we shall soon see little by little, and step by step, those dreams manifest into reality before our very eyes. Happy Full Thunder Moon! The Moon is in Capricorn along with Pluto Rx opposing the Sun and Mars in Cancer, marking an especially fiery and passionate Full Moon in the sign of the Goat. The name Thunder Moon comes from the Native Americans who observed that thunderstorms are most frequent during this time. It is also known as the Buck Moon because July is normally the month when deer's antlers begin to grow. The Capricorn Moon itself usually brings a more reserved energy, but being so close to Pluto Rx and forming an opposition to Mars could bring those suppressed energies to the surface. This can either be a refreshing opportunity for us to express how we really feel, or it can be a more intense stimulus for us to express long kept secrets or hidden emotions. 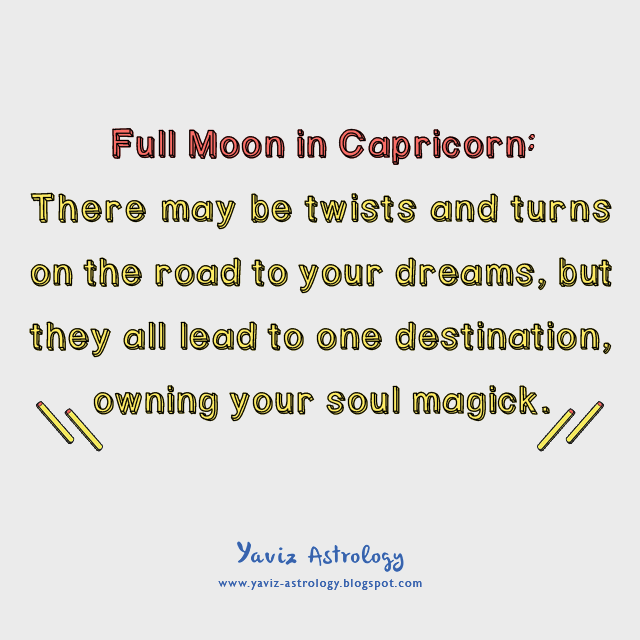 Regardless, the Capricorn Full Moon is guiding us back to work on those emotions, as well as to help us release old feelings and outdated beliefs we have about our life. Planet Saturn is the ruler of the Capricorn sign. Ruling the 10th House in Astrology - or the House of Career and Social Status, Capricorns are known for their tenacious and ambitious nature. They may seem aloof, indifferent or dictatorial at times, but deep down they're just trying to find a sense of security in their life. Once they are able to move beyond their melancholy and stubborn side, they can be some of the most genuine, reliable and wise people out there. Like everything related to the 10th House, our calling and life mission are also highlighted when we're thinking about what it is we really want to do. How much do we really want to achieve? How can we express our soul more fully? The answers to these questions always lie within us — we just need to look deeper into our heart to find them. With the Capricorn Moon forming a conjunction to Pluto Rx and an opposition to Mars and the Sun, it's time for us to really go for our dreams because we have the energy for it. Doing something we love will be more special at this time, and this can work up our appetite even more than usual. What we have becomes more important with a deeper sense of connection. Get together with good friends or family members. Talk about life, as well as about goals and dreams. Our sensitive understanding will be appreciated, just trust our intuition on this. What we say will have real meaning when we speak from the heart. With the Moon's square to Uranus, there could be an opportunity for us to make our way to something new and daring but it comes our way for a reason. Try not to let our emotions get in the way, instead let them inspire us to do things a little differently than we usually do. Pay closer attention to our feelings, and trust that they are accurate. Even feelings we don't want to face are delivering important messages to us. Keeping our mind open to all possibilities, and believing more in ourself to make a change will help put things in the right perspective. The Moon is also forming a sextile to Neptune Rx and Saturn Rx, and some vivid, inspiring and intense dreams or visions could come our way. Make sure we keep a record of them, as our deeper inner world may be trying to tell us something. Make a list of all the images we can remember and analyze what these images symbolize to us. With both Neptune and Saturn currently in their retrograde phase, we could come up with some profound insights about ourself and the world. Just remember to take a break from thoughts that are linked with the past and to concentrate more on the future. Know that emotions may come and go, but in the end it is we who have true power in the present moment. The power to make our own decisions. The power to change our mind and go the other way. The power to break free from personal or family patterns. This is a reason to start anew in our life, and to leave the old behind. With little adjustments we can make things happen this week and form it the way we want it. Pursue what we really want to do. Let our spirit shine by being free with our instincts and happy nature. The Full Moon reminds us that this is a powerful time of manifestation. If we radiate pure egoless love, we will find happy experiences. And if we exude fear, we will see and feel undesirable results. The great thing is that we always have the power within us to turn things in a better direction by filling our heart, mind, words and actions with love. It's time we work our magick.